EPA is working with partners on the Cyanobacteria Assessment Network, one of the most wide-ranging freshwater monitoring systems in the country. 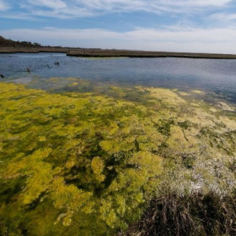 The project uses satellite data to monitor algal blooms and develop an early warning system for toxic and nuisance blooms that may harm public health. To learn more about this project, read the story "Researchers Creating Warning System for Toxic Algae in Lakes." As wildfires plague the West and other locations in the U.S. this summer, wildland fire smoke may impact the health and productivity of communities. Citizen scientists can help researchers learn more about these impacts by using a pilot mobile app in a crowdsourcing study. The study, called Smoke Sense, is the first of its kind to use a mobile app to evaluate the health effects from wildland fires, and to test whether an app is an effective tool to inform the public about the health risks of wildland fire smoke. Breathing in smoke from wildland fires can cause eye and throat irritation and cause more serious health problems for children, older adults, and those with lung or heart disease who are more vulnerable. Users of the app will be able to learn about wildland fires and smoke health risks in their area. They can also anonymously report their health symptoms during smoke events and the range of actions they are able or willing to take to improve their health condition or lower their exposure. Badges can be earned for each week a user participates. The study is being conducted during the 2017 fire season. Researchers will evaluate the results of the pilot and then make the app available again in 2018 at the start of wildfire season in the summer. The app is available to the public for download on Android devices here. Nanomaterials are tiny materials engineered with unique properties for specific uses—like improving the appearance and performance of sunscreens on the skin, disinfecting germs or making plastics stronger. They are made from metals, metal oxides, and carbon with dimensions between 1 and 100 nanometers. To put that into perspective, a single strand of hair on your head is between 80,000 and 100,000 nanometers thick. Today, manufactured nanomaterials are in more than 3,000 commercial products. But how do those materials interact with the environment and people at each stage of their lifecycle—during development, production, and after they are used and discarded or washed away? Due to the rapid growth of engineered nanomaterials, it is a challenge for regulators and risk assessors to understand the potential for exposure, and the risk associated with that exposure. Scientists also don’t know whether methods used for assessing the health risks of conventional chemicals can be used for nanomaterials. To better understand exposure to and risk from nanomaterials, EPA researchers have developed a new structured approach, or framework, to evaluate the potential risks of nanomaterials. The framework reflects probable routes for how nanomaterials will move through the environment and where they might end up, any transformation that occurs, and how people or ecological species may become exposed. Researchers are hoping that after the framework is applied to several examples, they will have adequate data to identify a few critical steps along these exposure pathways that are key for predicting both exposures and hazards. Using the framework in this way would simplify assessments of the potential impacts of engineered nanomaterials and support risk-based decisions. 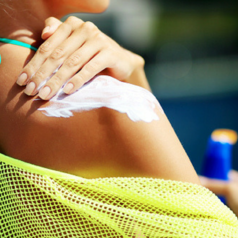 EPA scientists developed a case study using this framework to look at sunscreens containing insoluble titanium dioxide nano particles (nTiO2), which are efficient filters of UV light and deflecting its harmful radicals. By applying the framework, they found that a chemical and/or physical transformation occurred due to interaction with swimming pool water, potentially altering the impact of these materials on public health and the environment. Then they assessed these impacts, a necessary step for protecting public health and the environment. EPA scientists are continuing to apply this framework to understand even more about the lifecycle of sunscreen and other engineered nanomaterials.